Welcome to MTB Network Portal Help pages. Please select an option from the navigation menu on the left. You can also find instant help on individual pages by clicking on the icon. If you still have questions please send us an email at sturkarslan@systemsbiology.org. Genes page will display table of Mycobacterium tuberculosis H37Rv genes. Genome annotations are mainly derived from Tuberculist . Locus name is linked to individual gene pages that include more detailed information. Various filters can be used to pinpoint gene of interest. Symbol: Gene Symbol if available. Cholesterol Essential: Indicates if the gene is found to be essential for in vitro growth on Cholesterol. Griffin Essential: Essentiality score of in vitro growth. Bound by: This column will list number of TF(s) that were found to bind to upstream of the given gene in ChIP-Seq experiments. Binds To: If the gene is a TF, this column will list number of target genes that it binds to as identified in ChIP-Seq experiments. Genes table can be further filtered by number of criteria. Multiple filters can be combined to create more specific queries. Sorting can also be changed based on different parameters. Simply select filters you want to apply, select sorting method and press "Apply". Regulators page lists regulatory influences identified through Inferelator algorithm. The Inferelator is an algorithm for infering predictive regulatory networks from gene expression data. It does so by selecting the regulators (transcription factors or environmental factors) whose levels are most predictive of each gene or bicluster's expression. Target Bicluster: Bicluster predicted to be regulated by given TF. Link will take you to the module page. Weight: Weight of the regulatory influence. It can be positive (up-regulates) or negative (down-regulates). Higher absolute value of the weight is associated with confidence of the influence prediction. Regulator Taxonomy: List all other modules that are predicted to be regulated by the same TF. Filters: Regulators table can be further filtered by searching for a specific Regulator, Interaction or weight. Regulatory module (bicluster) refers to set of genes that are conditionally co-regulated under subset of the conditions. Identification of modules integrates co-expression, de-novo motif identification, and other functional associations such as operon information and protein-protein interactions. Modules are based on cMonkey algorithm and Inferelator regulatory influences on these modules. The landing module page shows quick summary info including co-expression profiles, de-novo identified motifs, and transcription factors as regulatory influences. Expression profiles is a plot of the expression ratios (log10) of the module's genes, over all subset of the conditions included in the module. The X-axis represent conditions and the Y-axis represents log10 expression ratios. 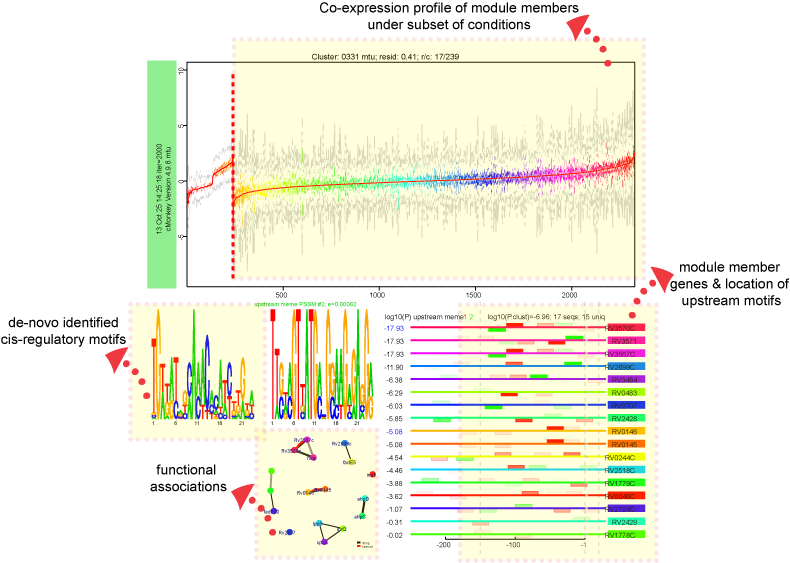 Each gene is plotted as line plot with different colors. Colored legend for the lines are presented under the plot. De novo predicted motifs for each module are listed in the module page as motif logo images along with associated prediction statistics (e-values). The main module page also shows the location of these motifs within the upstream sequences of the module member genes. Biological networks contain sets of regulatory units called functional modules that together play a role in regulation of specific functional processes. Connections between different modules in the network can help identify regulatory relationships such as hierarchy and epistasis. In addition, associating functions with modules enables putative assignment of functions to hypothetical genes. It is therefore essential to identify functional enrichment of modules within the regulatory network. We use hypergeometric p-values to identify significant overlaps between co-regulated module members and genes assigned to a particular Gene Ontology category. P-values are corrected for multiple comparisons by using Benjamini-Hochberg correction and filtered for p-values ≤ 0.05. Functions page will display functional annotations for Mycobacterium tuberculosis H37Rv from different resources. Currently, functional annotations from GO, KEGG, UniPathways and InterPro are included. Each function is linked to gene entries listed under this function. Unipathway is a manually curated resource of enzyme-catalyzed and spontaneous chemical reactions. All MTB associated Unipathway functions are listed in the table. InterPro provides functional analysis of proteins by classifying them into families and predicting domains and important sites.